Have you seen our Cookies & Cream Cupcakes? 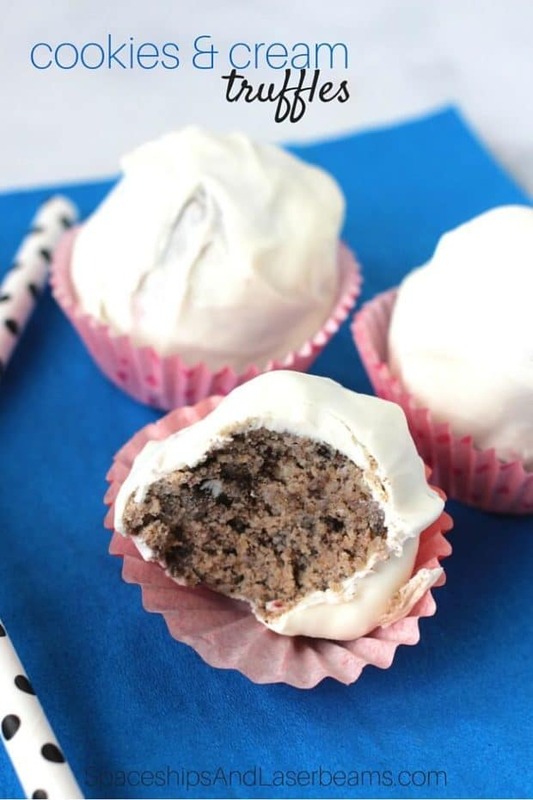 These Cookies & Cream Truffles are a great way to use up any extras – or use up any white cake or cupcakes you have hanging around after a party. Looking for a sweet treat idea? Check out these Peeps Cupcakes! Get set for warmer weather with this Picnic Playdate Menu and Ideas. 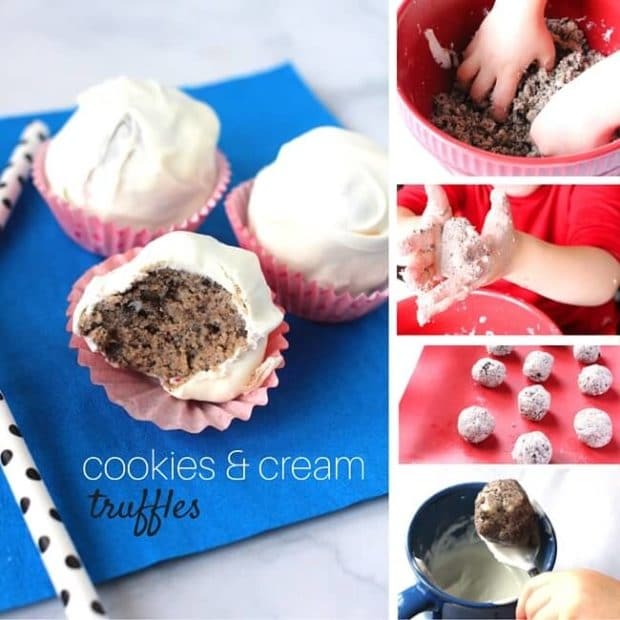 These truffles are an easier option than cake pops and are a great way to get a second dessert out of a batch of cupcakes or some leftover cake (like the trimmings off of a layer cake). While these are a no-bake recipe, they do require that you have cake or cupcakes on hand. 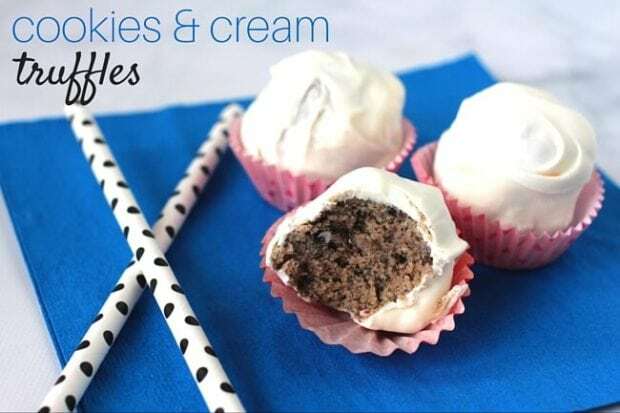 If you just have Oreo cookies – check out my no-bake Oreo Cookie Balls recipe. You can use your hands or a food processor for making the “truffle dough.” I made mine with my 4 year old so I let her dig in! 1. Crumble the cupcakes into a fine crumb and then add the frosting until it forms a dough – it should stick together when squeezed, but not stick to your hands. 2. Roll golf ball-sized portions of the dough and place them on a baking sheet. You can optionally freeze for 1 hour or overnight, but freezing is not necessary for this recipe. 3. When ready to coat your truffles, microwave your candy melts with the shortening in 30 second bursts, stirring well in between each heating. 4. Using a spoon, dip the truffles into the melted candy, and then set back on the tray to dry. 5. If you have extra cookie crumbs, be sure to sprinkle a few onto the truffles before the candy coating dries. 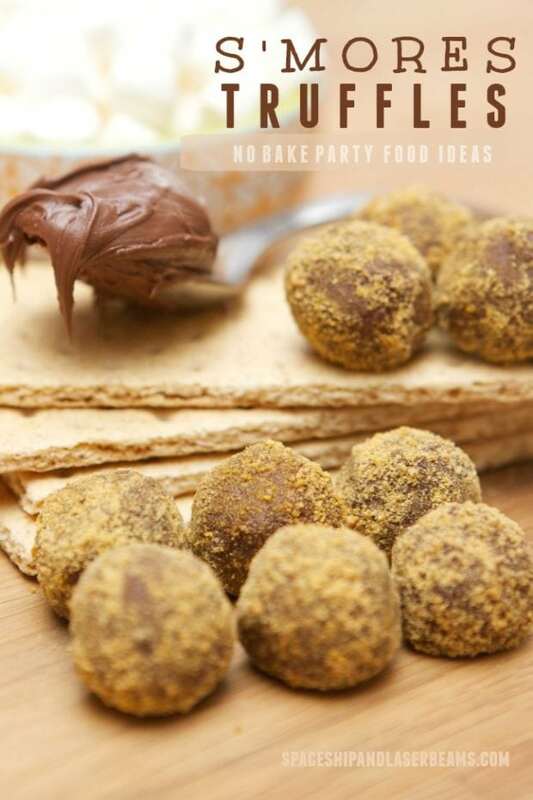 Bake up a fun summer treat kids will love with these great sources gathered by the crew at Spaceships and Laser Beams. Check out more great dessert recipes.